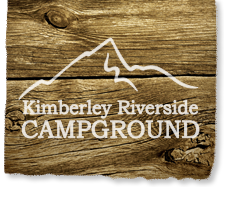 The Kimberley Riverside Campground has over 140 spacious, private, full or partially serviced sites, all of which have a private fire-pit and picnic table for your enjoyment. Exclusive use of the individual group area at no extra cost, only pay per tent. Very clean, well kept & quiet! We always come back!